This model has been equipped with a 22cc Tanaka Pure Fire engine; an advanced two-stroke unit that delivers its ample power (0.87hp) with reduced emissions and lower fuel-costs when compared to lower-specification engines with similar power ratings. The Tanaka TCH22EBP2 (50) Petrol Hedge Trimmer boasts a set of expansive 500mm double-sided, dual-reciprocating blades that will enable you to cover a substantial hedge in quick-time. 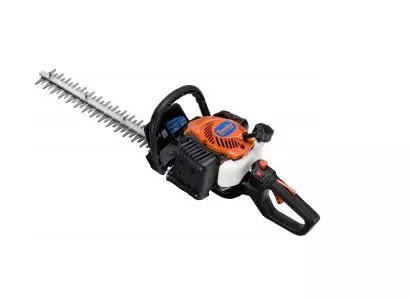 A blade-pitch of 30mm means you’ll be able to trim thick, woody growth without fear of the twisting and chewing that can lead to damage to the hedge, while a 180˚ Quick-Twist™ rear-handle makes it possible to achieve the optimum angle of attack; and also facilitates comfortable left-handed operation.